Encourage students to see God's Word as a fascinating subject that's relevant and important to their lives. 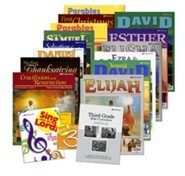 This Abeka Bible Grade 1 Curriculum Kit contains all necessary Flash-A-Cards for the year; a CD with hymns and choruses; and a daily lesson plan curriculum guide to tie everything together. 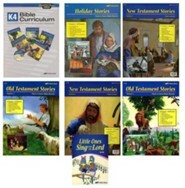 This grade 1 curriculum includes lessons on the Life of Paul, the Life of Jesus, and the book of Genesis. 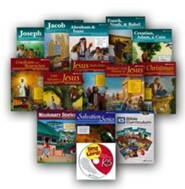 The Bible Curriculum lesson guide provides the structure for each lesson, and lists: the pledge, songs, Scripture verse, prayer, doctrinal drill with scripture questions and answers, and notes on which Bible lesson (in the Flash a Card) to cover. 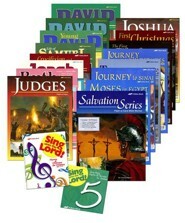 Flash a Cards are full-color, attractive illustrations of Bible events. 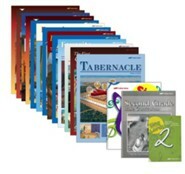 These 8.5" x 11" cards can be used as teaching aids or attached to a classroom wall or bulletin board. A teacher's guide is included, which provides the stories to read for each illustrated card. 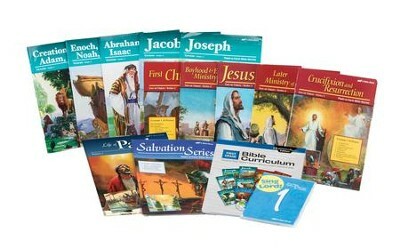 Grade 1 Bible Curriculum, 96 pages, softcover. Q: What items are in this year 1 pack? 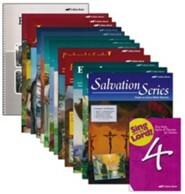 This kit contains the daily Lesson Plan book, Sing-a-Long CD, and Bible stories for the full year which includes the Genesis Bible Stories, Life of Christ Bible Stories, Life of Paul, and the Salvation Series book. 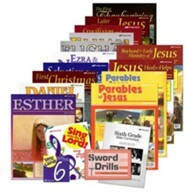 It does not include the Bible Friends Activity Book, #143389 which can be purchased separately. 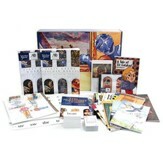 I'm the author/artist and I want to review Abeka Grade 1 Homeschool Bible Kit.